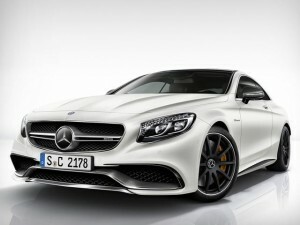 Mercedes-Benz has revealed the range-topping version of its rather gorgeous new S-Class Coupe. It is of course, the one fettled by those sensible types at AMG. Meet the S63 AMG Coupe. Naturally, it moves the game on from the CL63 AMG that preceded it, and as such is 65kg lighter than that last car thanks to a lightweight battery, forged alloy wheels and lighter composite AMG brakes. In fact, the entire outer ‘skin’ and front end is made from aluminium too, helping the new S63 AMG achieve better fuel consumption. Which you probably won’t be too concerned about, chiefly because the lighter weight also makes it faster. HIGH-END Mercedes are known for their new whizzbang tech on release, and the new S63 AMG Coupe is no different, coming with a new type of suspension which makes the car lean into a corner like a motorbike can — working by using magic. Magic Body Control, that is. No joke, that’s what Mercedes is calling the new system. What that means is, the car has sensors which detect the road and adjust each individual suspension strut’s angle to suit the corner.